KATHMANDU, Nepal (CNN) -- Nepal's Maoist government took the president to task Monday for ordering the country's army chief of staff to stay in office after they had fired him, calling the decision "unconstitutional." 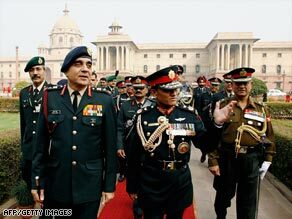 General Rookmangud Katawal gestures after inspecting a guard of honor in New Delhi on December 12, 2007. "Neither the constitution nor the Military Act gives the President the right to do anything besides supporting the government's decision," said Krishna Bahadur Mahara, the minister for information and communication. Late Sunday night, President Ram Baran Yadav ordered Gen. Rookmangud Katawal, who was sacked by the government Sunday morning, to continue in office. Nepal's interim constitution gives the president powers as supreme commander of the army and guardian of the constitution. "The president took the step after 18 parties in parliament requested the President to intervene," presidential spokesman Rajendra Dahal told CNN Sunday night. The decision to fire Katawal touched off protests. Supporters of both sides in the dispute took to the streets for demonstrations Sunday. Despite sporadic clashes between the two factions, there were no serious injuries reported. The coalition government led by the Unified Communist Party of Nepal (Maoist) -- better known as Maoist -- leads a minority government for which its largest coalition partner, the Communist Party of Nepal (Unified Marxist Leninist), has withdrawn support. It is unclear if the government will fall, since Madhesi Janadhikar (People's Rights) Forum, another coalition partner and the fourth largest party in parliament, is undecided about staying in the government. Nepal's Cabinet voted to dismiss Katawal after the military refused the government's order to stop recruiting about 3,000 new soldiers to fill vacant positions when it has yet to take in former Maoist rebels, as a 2006 peace deal required.